*enters room panting and breathless* Hey, sorry. Yeah. I had to run out and get some bellbottoms, sandals and a new shirt before writing this. Get into character, ya know. Right on. Ok. Lava lamp, on. Patchouli, burning. Bummer. No black light. It's all good. Where was I? Oh. Moon Coven. Amanita Kingdom. Seems like anymore when I hear that a band is from Sweden my thoughts go in the direction of retro-styled stoner rock rather than death metal. Bands like Witchcraft, Horisont and Truckfighters being some of the more well known of the style. 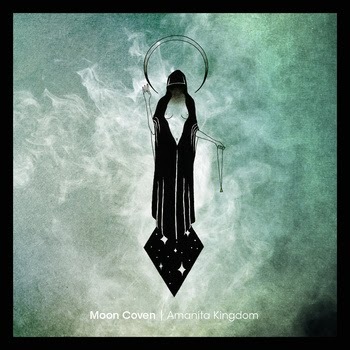 Moon Coven stands to join those fuzz-riden heavyweights with debut Amanita Kingdom. Touted as an EP, the album actually clocks in around 34 smoke-addled minutes. But it is only five songs. Five totally solid songs. The quintet features three guitarists making their groove-heavy riffs dominate the speakers with a monstrous fullness. Despite the immensity of tone, the power lies in psychoactive realms rather than a simple display of volume. Moon Coven's aural aesthetic is one of impeccable smoothness; their highly repetitive jams feeling effortless and natural. Fuzzed-out riffs and blazing solos float by with an ethereal lightness and a desert tranquility. Carefree and relaxed, the listener easily falls into Amanita Kingdom's embrace leaving all troubles behind. That feeling of escapism is a theme that runs throughout the album. The clean vocals sound distant and dreamlike, and carry with them a detached sort of bliss. Music this authentically vintage sounding calls for nothing less. (But can you believe these guys used to be in a tech-metalcore band?) One can hear an analog hiss to go along with the overdriven amp worship. It's a package that points to the obvious influence of none other than Dead Meadow. My reaction upon hearing lead track "Ruler of Dust" back in October was strikingly similar to when I first laid ears upon a Dead Meadow record playing in a record shop all those years ago. That being "OHMYGAWDIMUSTHAVETHIS." Both bands have that quality that instantly binds to the soul lending a familiarity bordering on predictability without feeling like a rip-off or stale. It's like a sympathetic resonance. Ya, that's it. Moon Coven's debut takes what it means to be stoner rock and embodies it wholly. Heavily psychedelic and mind expansive with a keen sense of melody and a few Sabbathian licks thrown in for good measure makes it easy to get completely absorbed in Amanita Kingdom. They make it all too easy to sit back, surrounded by the comforts of delirium, gaze into the night and wonder where it all went wrong out there. Headphones are highly recommended although intense volume would also suffice. So Amanita Kingdom. Dude, it's like totally......psilocybacious! Know what I mean?! Just choose the right mushrooms, man.